This is my second time doing Michelle Mach's blog hop challenge, and you seriously need to go visit her blog and subscribe so that you don't miss out on the next adventure...you just never know what all is going to be in your package! The last time, I made a fabric cuff bracelet, so this time I challenged myself to come up with something other than wearables. 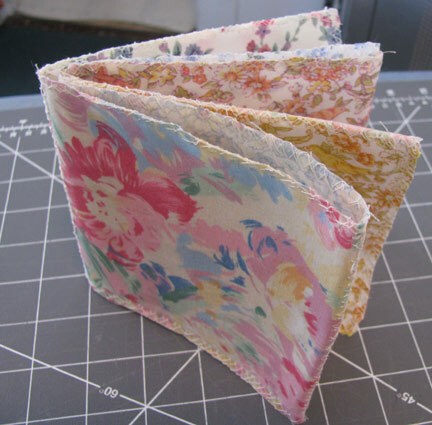 Like a fabric book! I had the perfect book sitting there decoration-less: it's an X-book that I made back in the early spring. Instructions for constructing your own are at the link. So what to do with it for this challenge? Decorate the cover, of course! See a little disconnect in the colors? Not to worry. I supplemented the challenge packet with some beads from Vintage Beads from Europe and now I think the colors work just fine. 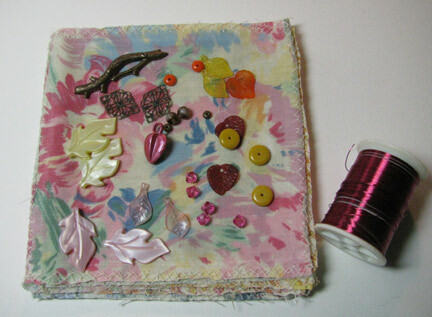 You'll notice that I didn't manage to use all the beads from Michelle's package, but I hope that as I work my way through the fabric book, the rest will find a home. 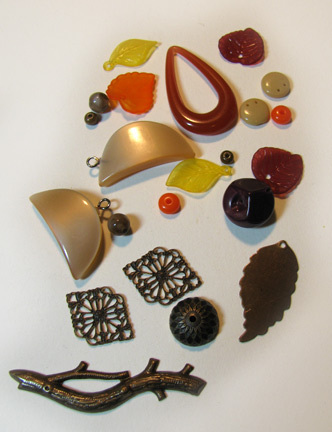 If you'd like to have instructions for how to make the wired embellishments for your bead embroidery, they're found in Chapter 4 of my e-book, Found objects and unusual materials. Please visit all the participants to see what wonderful projects they came up with! The colors of your project really compliment your fabric choices. Great job! What a great idea and wonderful use of so many of your kit components. This is smashing!! VERY cool! It never occured to me to do something other than a wearable! I love this!! What a great way to use those beads! Never would have thought of that! I love that you made something unconventional! Awesome. I always forget that designs do not have to be jewelry. I love how you wired the components together and added the leaves from your stash. Great idea! Thinking outside the box! Very cool. The book is so pretty, and I can't wait to see what you do to the rest of the pages! What a lovely idea! And it came out so nice! This is gorgeous! It's so cool to see so many non-jewelry items this time around. What a unique idea! So dainty and girly, I feel like I should dress in pink and wear tiny cotton gloves to view it, like ladies from an earlier era. Vintage indeed! Very pretty! A lovely vine and I like that you've stitched it to something like that. A very creative project. What a great idea! I love the way it turned out! I need to start thinking beyond the wearable . . .
How cool! What a great interpretation of the elements. Wonderful! It's really lovely. The addition of the pink really makes the piece compliment your book perfectly. So pretty, and unusual!! 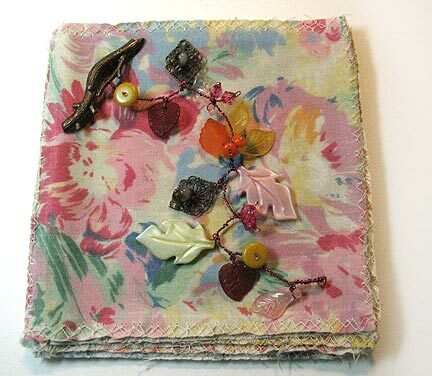 Very clever, and your beads perfectly compliment the fabric you chose for the book. Trust you to do something totally different! 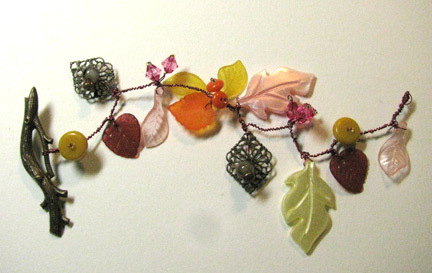 What a clever idea to wire the components together and mix them with your own beads to make the color palette your own. Wow Cyndi, I love how this turned out! I'm off to check out all the other links! Wow, what a great idea. It turned out so pretty, too. I love the beads you chose for this, Cyndi. Very fall.